The Château dAgel is a medieval castle In the heart the Languedoc region with a long history stretching back before the Cathar period. 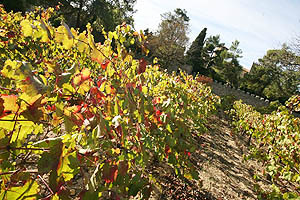 It lies in the Minervois region, nestled at the foot of the Black Mountains. 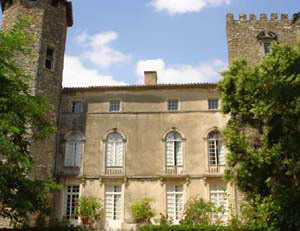 The oldest part of the present chateau dates from the 12th century. The château is one of a line of fortified castles built by vassals of the Count of Toulouse and used to resist the Albigensian crusaders in the 13th century. 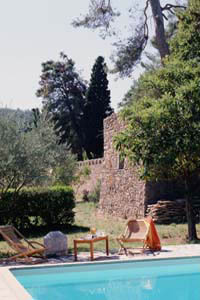 Today this is just about the only Cathar Castle that you are able to stay in. the restored and modernised castle is in private hands, and available for private hire: exclusive use, weddings, private events, corporate events and as a film location. 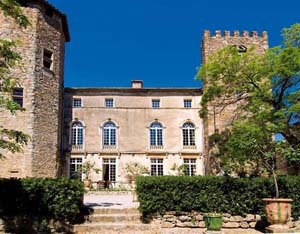 The Château d'Agel is located in the heart of Cathar Country in the Languedoc, 10 km from Minerve, another Cathar Castle, which gives its name to the Minervois area. 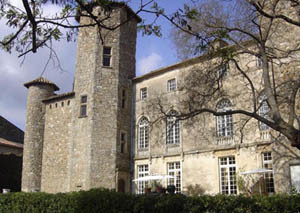 The chateau consists of the main building, four towers and a dovecote. 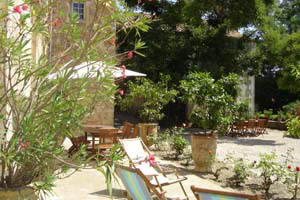 Its extensive terraced gardens covering 2 hectares (5 acres) offer extensive views over the Cesse valley and the Pech mountain. 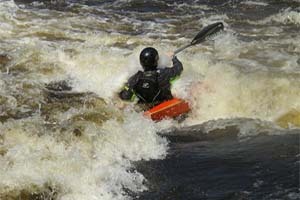 It is ideal setting for many activities. If what you have in mind is getting away from it all with family or friends, you can rent the entire château and have the buildings, park and pool all to yourselves. 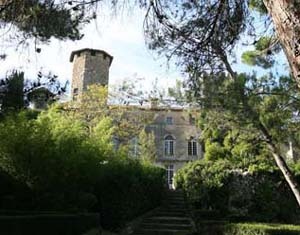 Your hosts, Martine Ecal-Besse and her husband Jean-Marie, look forward to welcoming you to a truly memorable stay in the beautiful, atmospheric surroundings of the Château d'Agel, their family home. 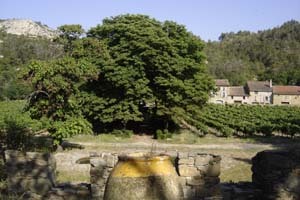 From evidence in the oldest part of the château it is known that in the year 1100 its owner was Bernarde, Lord of Agel, Minerve and Cazelles. 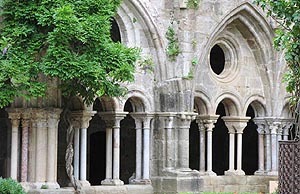 In the early 12th century the South-West of what is now France, but was then a semi-independent state, was rocked by the scandal of the Cathar Wars or Albigensian Crusade. A local form of Christianity was becoming ever more popular and according to some had already become the majority religion of the area. The Catholic Church regarded it as both a heresy and a threat. The "heresy" was strongest in the county of Toulouse and all over Languedoc, where vassals of the Count of Toulouse refortified a line of castles to protect themselves against Papal forces. Agel. was one of that line of castles refortified to resist the Pope's forces. The Crusade against the Cathars, led by Simon de Montfort, raged throughout the Languedoc. 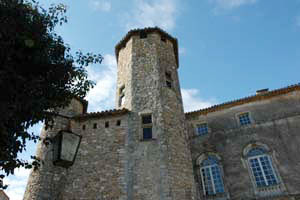 In Simon's bid to take nearby Minerve in 1210, the château d'Agel was almost entirely destroyed by fire. In July of that year, Minerve fell, and the 180 Cathars who had taken refuge there met their end on a burning pyre. 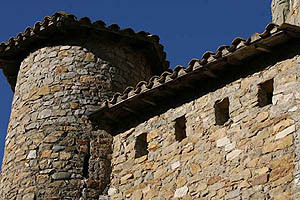 The Château d'Agel, with its commanding position over the Cesse valley was of great strategic importance to the Cathars. Simon de Montfort ordered Aymeri, Viscount of Narbonne, to besiege the château, but Guiraud de Pépieux, Lord of Aigues-Vives and Agel, escaped during the night to Minerve, taking with him two French knights that he had captured. 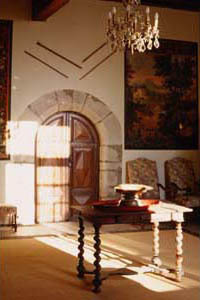 The architecture of the Château d'Agel reflects its continued use over the centuries. 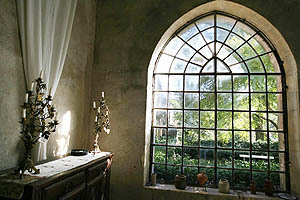 Thus for example window styles, vary from the tiny windows of the stark 12th century fortress to the beautiful windows of the Renaissance with ornamental balusters and capitals. During the Seventeenth century, Renaissance embrasures were replaced on the principal frontage by broad bays with small squares in the style of Trianon. The history of the Château reads like a gallery of feudal lords of South-west France, many of them called Bernard. From 1304 to 1432, came Bernard d'Auriac, Guillaume de Molini, Bernard de Maureilhan, Bernard Randulphe, Pierre de Bongigosis, Bernard de Haupoul, Bernard d'Auriac and Bernard d'Aimard. In 1432, a sale is on record from Bernard de Corsons to Gabriel de Verseilles. In 1543, the new owners of Agel are Pierre and Simon de Beauxhostes. 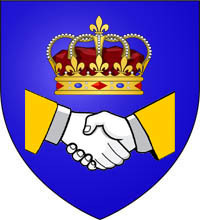 The arms of the Beauxhostes family (two interlaced hands surmounted by a crown) were granted by King Philippe Le Bel to Jean de Beauxhostes, whose origins were English. Following Jean de Beauxhostes' success in the Battle of Furnes in 1270, King Philippe Le Bel declared to Beauxhostes: "I give you my hand as a pledge of the faith that you and your descendants will show to us and our descendants". Since that time, the intertwined hands have featured in the arms of the Château d'Agel. Look out for them on the monumental mantelpiece in the Great Hall. 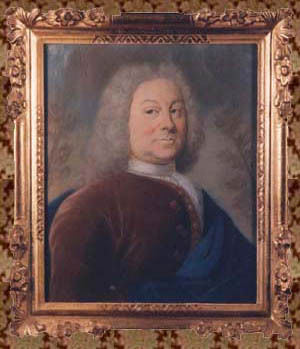 In 1764, the property is recorded as having been sold to Jean d'Augier of Narbonne. Thereafter, Agel continued to pass as a legacy from one owner to another, until it passed into the hands of the present owners, the Ecal family. By the first half of the 20th century, the Château had fallen into disrepair, and the northern wing in particular had become a ruin. 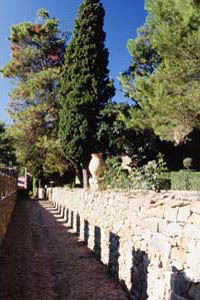 In the 1960s the Ecal family began the task of restoring the property and its gardens to their former glory. 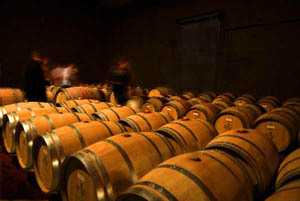 The result you will see when you visit today: a château with a cachet all of its own in an unchanging rural setting. 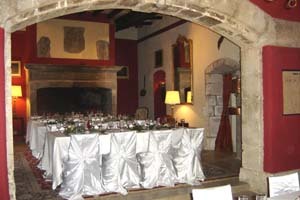 You can rent the entire chateau (800m2) sleeping up to 13 people with facilities (eg seating) for around 370. 2 living rooms, 1 library, 1 office, 2 dining rooms, 1 kitchen, 6 bedrooms, 5 bathrooms, park of 2ha. 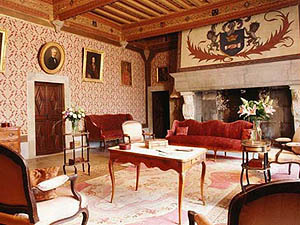 On the ground floor: a spacious entrance hall leading to the Great Hall, the small drawing room, the library and the dining room. Kitchen and lavatories nearby. On the first floor: the upstairs drawing room, four double bedrooms, one triple bedroom, four bathrooms. 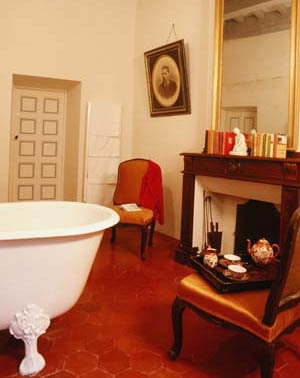 On the second floor: A double bedroom, a bathroom. 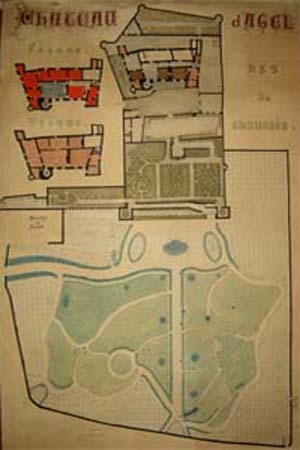 Park : Summer dining room in the orangery, terraces, box hedges, swimming pool, vines. 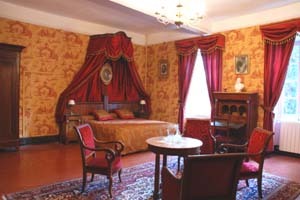 Chambre Lucie: A room for two (double bed or twin beds) with bathroom. If necessary an extra bed can be provided for a third person (Sofa bed). 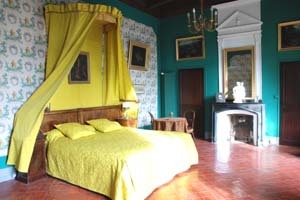 Chambre Pauline: A room for two (double beds or twin beds) with bathroom. 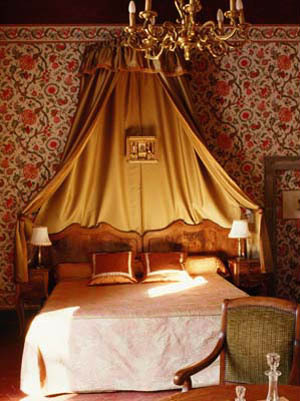 Chambre Chinoise: A room for two (double beds or twin beds) with bathroom. 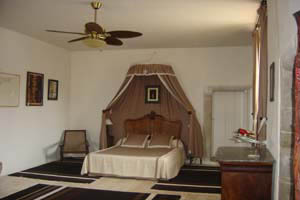 Chambre Coloniale: A room for two (double beds or twin beds) with bathroom. Comfort : central heating - open fire. Communications: Satellite TV - DVD reader - Hifi - Internet ADSL. Domestic equipment: refrigerator - freezer - cooker - microwaves - electric coffeemaker - toaster - kettle - pressure-cooker - dishwasher - washing machine - dryer - iron - hair-driers. 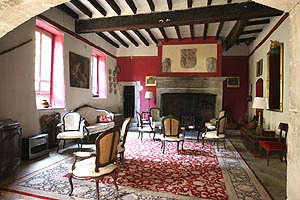 The chateau is available for exclusive hire. 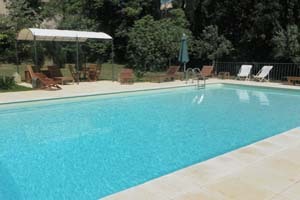 You can rent the entire chateau (800m2) sleeping up to 13 people. 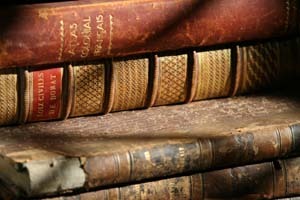 Soak up the atmosphere of the chateau's rich history as you wander its vast halls, or pause for reflection in the Library. Relax in the comfort of its spacious bedrooms. Enjoy breakfast with a view over the park. 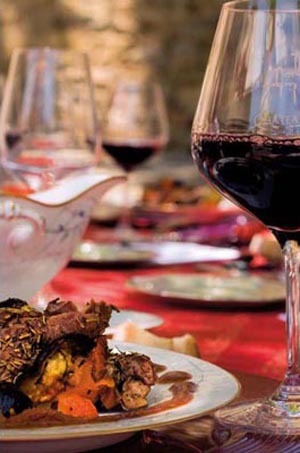 You have the option of catering for yourself or having your meals prepared. You can also hire members of the domestic staff (maid, cook, baby sitteretc.). 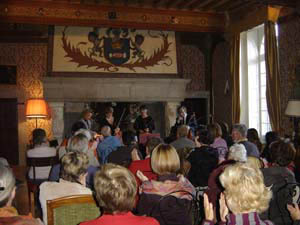 Receive your guests at the Château entrance, in the Orangery or in the park. 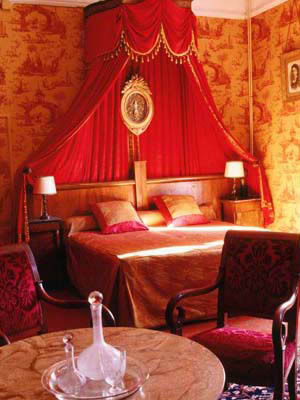 You have the possibility to sleep in the castle with your close relations (13 people) and we will provide you a selection of B&B and hotels near the castle..
Four drawing rooms interconnected : 30 m2, 15 m2, 50 m2, 60 m2. 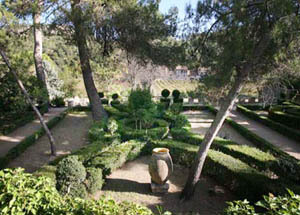 Three terraces: 40 m2, 120 m2, 100 m2. A marquee can be set up in the park : seating capacity 200 people. 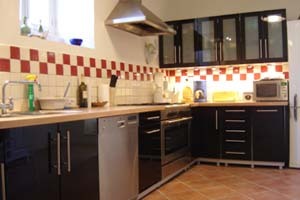 Kitchen of 20 m2: cooker 5 fires, washing machine, refrigerator, freezer, microwave. Cellar of 90 m2 which can be used as bar or place of storage. 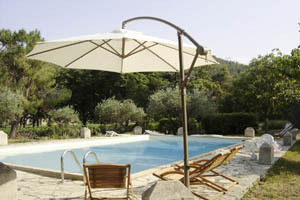 Click here for current rates on the chateau d'Agel website. If you're planning a photo, advertising or film shoot in a historical setting of outstanding beauty, you can hire the entire château and park, or just part of it. Contact the owners for current rates using the email address above. 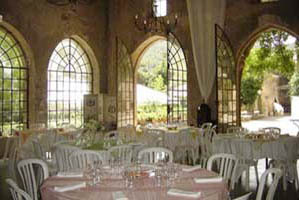 The Château d'Agel occupies an exceptionally beautiful site off the beaten track, and offers an agreeable and comfortable setting for your next company meeting, conference, training or team-building session, incentive event or "awayday"
or simply for when you need to get away from the office with a few colleagues to finalise an event, project or policy. 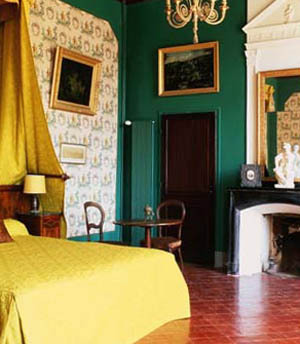 Two rooms are at your disposal : The red drawing room on the groundfloor and the Orangery. If you wish to organise a residential seminar at the chateau, You will to enjoy the drawing rooms, the park or the swimming pool and sleep within the chateau in our comfortable bedrooms (double rooms).